Some people are intimidated by laser tattoo removal simply because of the word laser. But once you understand how the procedure works, it can be quite fascinating! Laser tattoo removal is considered the safest, most successful method for getting rid of unwanted ink in the skin. In fact, the laser used for this procedure is designed to penetrate deep into the skin without damaging any of the surrounding skin tissue. Tattoo ink is embedded in the skin’s dermis layer where it becomes trapped due to the size of the ink particles. From that moment on, your immune system recognizes the ink as a harmful, foreign material and actively tries to remove it. This explains why tattoos gradually fade and lose color as time passes. Laser tattoo removal speeds up the natural fading process by breaking up the trapped ink particles into smaller pieces that are easier for your immune system to consume and get rid of. Multiple treatments are needed for all patients, especially those interested in completely removing their ink. Laser tattoo removal is not a one-size-fits-all scenario. Every patient and every tattoo is built differently so the number of treatments needed will vary per patient. Retrospect uses a list of variables to customize your treatment plan and best determine the number of sessions you’ll need to successfully achieve your desired look. For more information on how our laser works, call our Dubuque location at (563) 589-0169. 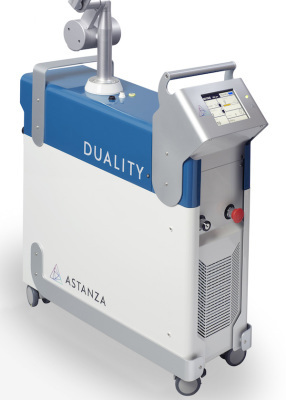 Laser tattoo removal is only as successful as the technology used, which is why we have invested in the latest industry-leading Astanza Duality laser. The Duality is the gold standard of Q-switched Nd:YAG lasers. This technology emits exceptionally short and powerful pulses of light energy with high pulse energy to produce strong peak power for optimal ink shattering and faster ink clearance. These features travel safely through the skin and target ink trapped deep within the dermis layer while leaving the surrounding skin tissue unharmed. Our Duality uses two versatile wavelengths to remove a wide range of tattoo ink colors. This advanced technology is safe to use on all skin types and is designed to minimize any adverse skin reactions. The Duality produces energy through a flat-top homogenized square spot beam, which distributes energy evenly, avoids treatment overlap, and helps mitigate unwanted side effects for patients with sensitive skin. The square spot design eliminates hot spots and is especially helpful for reducing the risk of pigmentation changes on patients with darker skin types. Retrospect invests in advanced technology to ensure our clients receive the best possible results in the fewest amount of treatments. 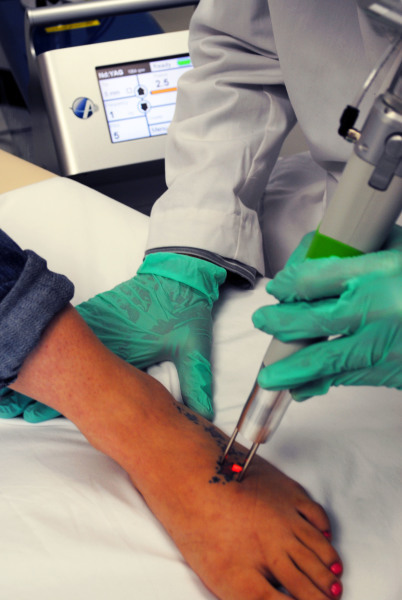 During your treatment, we’ll use the safest protocols and most effective wavelengths to remove or lighten your tattoo as efficiently as possible. Call our Dubuque office today to schedule your free consultation and learn more about our technology! Laser tattoo removal was originally introduced as a method for removing tattoo regret. However, more and more people are seeking laser tattoo removal as an option for lightening or removing an existing tattoo to make room for new artwork. And for good reason too! 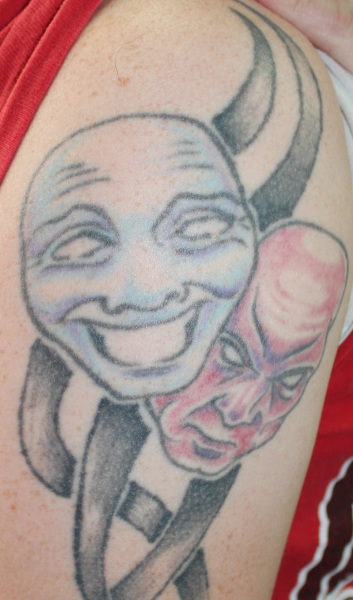 Cover-ups are a great solution for dealing with unwanted tattoos, however, they can be difficult to apply if the original tattoo is heavily saturated in dark ink. For example, a tattoo artist would have to use twice the amount of ink and space to completely conceal a dark black tribal tattoo. Even more, they would be limited to the number of designs they could create. Laser tattoo removal fades existing artwork to create a cleaner canvas for your tattoo artist to work on. This allows them to be more creative and flexible with their design and also creates more possibilities for you to achieve your desired tattoo. Retrospect firmly believes that you shouldn’t have to compromise the look that you want for something that will simply cover your unwanted tattoo. Our Dubuque clinic uses a variety of factors to assess how many treatments you will need to fade or remove your tattoo. Because we are conveniently located inside of Crow’s Nest Tattoo Studio, we can connect you with one of their talented and experienced cover-up tattoo artists.